Posted on September 16, 2011 by Susan H.
These ribs are easy to cook and assemble ready for the barbecue. Great for the boys’ Saturday night hockey games/practices that seem to hover around the dinner hour. 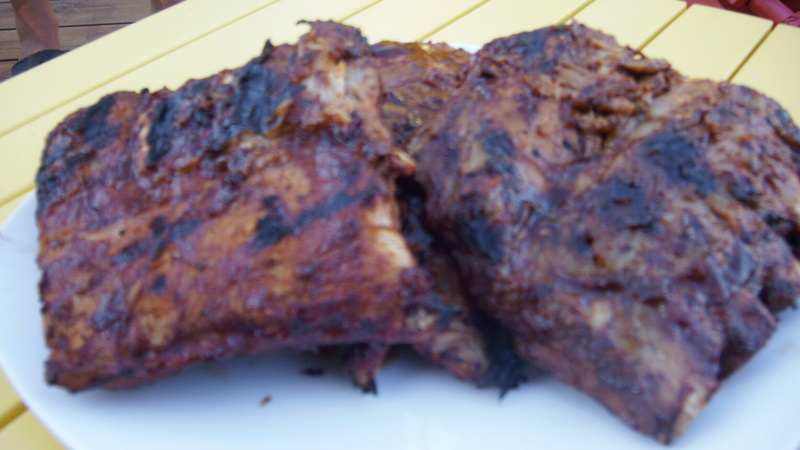 The recipe for our Barbecued Pork Ribs with Mustard Free Barbecue Sauce, is a tried and true recipe from my childhood. Anyone that has tasted these ribs, asks for the recipe. I usually make a few extra ribs to freeze for another quick ‘go to dinner’ or for Michael to enjoy for lunch the next day. Great to take to the cottage or to share with friends and family. Just defrost and barbecue. Double or triple the sauce to store in the fridge. The boys love it slathered on their barbecued chicken or pork chops. When I do purchase a commercial brand of barbecue sauce, I look out for caramel colouing in the ingredient list. Caramel coloring or flavouring can be derived from dairy. Either determine where it is derived from or stay away from products containing caramel. When Michael was younger, he would break out on Saturday and Sunday morning with eczema. During the week it would clear up and then…BAM… there it was again come Saturday and/or Sunday morning. The only thing I could think of was perhaps there was something in the treats he enjoyed on a Friday and/or Saturday evening…pop, chips, or popcorn. I started to eliminate them. When it came to eliminating the mini coke…..no more eczema in the morning. Reading the ingredient label I came upon caramel. He has avoided it ever since. It had been my experience (later studies confirmed it) that dairy can cause eczema. If I were to put a little milk in my tea before breastfeeding Matthew, his forehead would breakout in eczema. I did this a few times with the same results. Ultimately, I kept dairy out of my diet while breastfeeding. Soy Sauce may also contain caramel. Reading the ingredient list is crucial if you want to avoid products containing caramel. At present, I use President’s Choice Soy Sauce. Always check the ingredient list for any allergen you are trying to avoid as company’s change their product ingredient lists. Put ribs in a large pot covered with water and above ingredients. Bring to a boil and simmer for 45 minutes. Arrange ribs in a nonmetal, shallow dish. Spoon and spread sauce over the ribs in a non-metal container to cover. 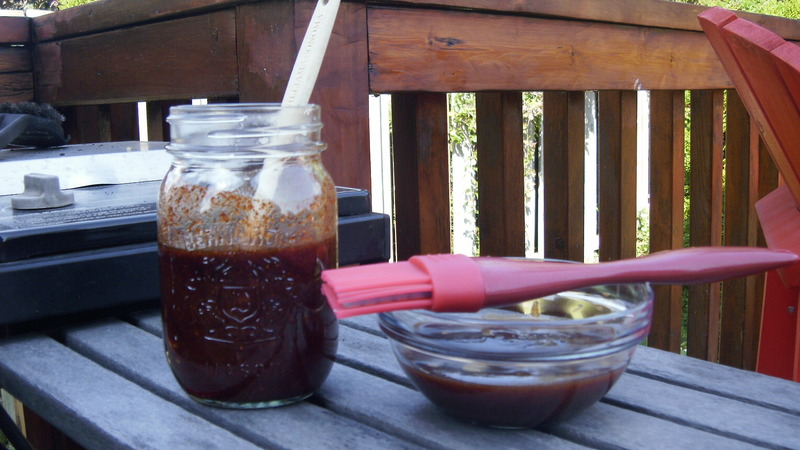 Save some sauce, or make extra, to baste while barbecuing. Grill ribs for 20 to 30 minutes on the barbecue, turning and basting frequently with the extra barbecue sauce. P.S. Matthew excitedly announced that our family should have our own Rib Fest. Each of us is to come up with a recipe for barbecued ribs. A feature blog to come! Always CHECK INGREDIENTS each time you purchase products. Have you adapted similar recipes for your own food allergy needs? I’d love to hear about them. Please share in the comments! This entry was posted in corn free, dairy free, dinner, peanut/tree nut free and tagged barbecue ribs with dairy and corn free homemade barbecue sauce, corn free homemade barbecue sauce by Susan H.. Bookmark the permalink.